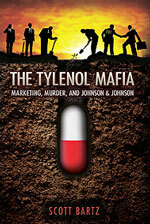 "The Tylenol Mafia," by Scott Bartz, an exposé of Johnson & Johnson’s manipulation of facts surrounding the murder of seven people in the Chicago area in 1982 via Extra Strength Tylenol, will create a big headache for J&J, the media that went along with this ruse, and authorities such as the FBI, local police and the courts that did flawed and even dishonest work. There’s no doubt that the public was lied to on a grand scale about the Tylenol murders that drew attention matching that which followed the murder of President Jack Kennedy in 1963. Also pulled into the wake of this tsunami of spin and lies were the textbooks that invariably praised J&J. A co-conspirator was PR Society of America, which gave J&J a special Silver Anvil in 1983 after J&J lost in the crisis category to Hygrade Food products. Winner was the campaign “Getting Hygrade off the Griddle” after bits of metal were found in some of its hotdogs. J&J was a regular advertiser in PRS publications for years and in 1999 the Robert Wood Johnson Foundation gave $2.6 million to Kids in a Drug-Free Society, a joint venture of the PRS Foundation and the Partnership in a Drug-Free America. "The Practice of PR" noted the recall was ordered nearly a week later and only after another Tylenol poisoning incident in Oroville, Calif.
Pitiful and emblematic of J&J’s “Who, Me?” pose is that it only offered a reward of $100K after the 1982 and 1986 murders. It should have offered $10 or $20 million. Other media that swallowed the myth that J&J acted quickly and ethically in regard to easily-spikedTylenol capsules (which should never have been marketed in the first place) included Fortune, The Economist, Christian Science Monitor, Motley Fool and Wikipedia. The Bartz book could impact the stock of J&J which is currently about at its 2002 level. Although immensely profitable, with net of $11.6 billion in 2010 on sales of $64.3B (it also owes $18.7B), J&J was $64.95 on Jan. 2, 2002 and is currently around $61. J&J is a holding company for more than 250 units. Only a small part of its sales are for its best known baby products and Band-Aids. Author Bartz has compiled thousands of facts that make a compelling case that the Extra Strength Tylenol capsules were mixed with cyanide while still under the control—faulty as it was—of J&J. His tell-all, insider’s book is of the same genre as Deadly Spin by Wendell Potter, which catalogued PR abuses in the drug industry and especially at Cigna. Potter had 20 years at Cigna. The Bartz book is expected to go on sale today on Amazon.com and is available as an ebook on Amazon Kindle and on Barnes & Noble’s Nook for $9.99. It is self-published. The Potter and Bartz books are must reading for those in PR as well as students, professors and PR journalists. A J&J employee 7.5 years to March 2007, Bartz has intimate knowledge of the distribution system of J&J including its use of “rack jobbers” and other third parties who put ingredients into capsules for J&J and others and deliver them to stores. Bartz, citing names, dates and other particulars, tracks a half dozen others, besides the seven in the Chicago suburbs, who died from poisoned Tylenols. He feels the number of victims is probably much higher. What suddenly brought the poisonings to the attention of hospital workers was that three members of the Janus family died in rapid succession of cyanide poisoning after taking Extra Strength Tylenols. Such poisonings otherwise had been widespread and escaped the attention of medical workers, Bartz says. Adam Janus, 27, died of cyanide as did his brother Stanley, 24, and his new wife. They all took Tylenols from the same bottle on the same day—Wednesday, Sept. 29, 1982. The Bartz pin prick that bursts the J&J PR balloon, which claimed that the Tylenols were being poisoned after they were on store shelves, was the death of Lynn Reiner, 27, who had given birth four days earlier to son Joshua. Her poisoned Tylenols came from the Central DuPage Hospital in Winfield as part of a kit given to mothers and there was no way that any outsider could get into the hospital’s dispensary to contaminate such pills. What muddied the waters was that Reiner also went to Frank’s Finer Foods in Winfield on her way home and purchased a bottle of Regular Strength Tylenol, mixing the gray and white regular Tylenols with eight red and white Extra Strength Tylenols. Astounding, to say the least, is the FBI’s reversal of its finding in 1986, after 23-year-old Diane Elsroth became another Tylenol/cyanide victim, that the packaging containing the poisoned pills was not violated and that the contamination therefore had to be on J&J’s watch. All hell broke loose after that finding and the FBI suddenly switched its opinion without providing details. Milt Ahlerich, FBI PA chief, initially said there was “no evidence of tampering” with either the containers or the packaging of the Extra Strength Tylenols that killed Elsroth. Three Tylenol bottles containing cyanide were found in Westchester. Bartz describes the protection on Tylenols that one J&J executive said would require a “tank” to get through. The Westchester boxes showed no tears, cuts or other signs of tampering., no evidence that the plastic shrink-wrap had been removed and then reheated, re-shrunk and re-applied, writes Bartz. There was no indication that the aluminum foil seals laminated to the lips of the bottles had been removed and re-laminated. The only adhesive on the lips of the bottles was the adhesive that the repackager had applied. The aluminum foil seals had not been torn or cut and there were no scrapes or nicks on the lips or necks of the bottles to indicate a sharp knife or razor blade had been used to remove the aluminum-foil seals. X-rays show no signs the bottles had been invaded—no cuts, no holes and no needle marks, writes Bartz. Invading the plastic bottle inside would involve cutting it and “melting the cutout back into place after tampering with the capsules,” noted the Washington Post Feb. 14, 1986. The FBI ruled this out. No further details were provided nor “proof that the packaging had been tampered with nor how it could have been done,” writes Bartz, who notes that Ahlerich refused to answer any questions. The Bartz book describes numerous complaints about the lab work of the FBI. Larry Foster, former VP-PR of J&J who got the Gold Anvil of PRS in 1989 and who is repeatedly and unfavorably mentioned in the book, said in a 2002 interview at his alma mater, Pennsylvania State University, that he knew how the bottles were invaded. Bartz says this version is not only “false and completely unbelievable” but conflicted with what both J&J and the FBI have said for many years. Foster left out the problem of invading the box sealed with glue that could only be dislodged by tearing it, says Bartz. The remarks of Foster and other J&J PR staffers are challenged at numerous places in the book. FBI staffers found many jobs at J&J, notes Bartz. Kevin Donavan, VP of J&J Worldwide Security, had a 25-year career with the FBI, rising to assistant director, New York, in charge of 2,500 agents and other FBI employees. His predecessor was Wayne Gilbert, who was with the FBI 28 years before joining J&J in 1993. Russell Deyo, J&J general counsel, was assistant U.S. attorney in New Jersey for eight years before joining J&J in 1985. As corporate secretary, McNeil Consumer Products Co. in 1991, he signed the 1982 murders settlement agreements. His job pays salary and bonus of more than $8 million, says Bartz. Families of the victims waited eight years before J&J agreed to a settlement. One of the Bartz charges is that the case has now been “reopened” as a means of keeping key documents under cover. Arthur Hull Hayes, Jr., head of the Food & Drug Administration and an unflagging supporter of the belief that the Tylenols were poisoned after delivery to stores, in 1991 became the COO of MediScience Assocs., a unit of the Nelson Communications subsidiary of J&J. Bartz charges that the FBI and State of Illinois continue to keep the 1982 Tylenol murders open as an excuse to deny investigators access to documents.